Across the country many properties are infested with Japanese Knotweed and often the owners and property maintenance companies are not aware. The problem is often identified when a property is surveyed for selling purposes. That individual property owner then bears the responsibility of organising quotations and liaising with neighbouring owners and often having to finance the eradication. There are many inexperienced Japanese Knotweed contractors now tabling expensive procedures which often do not work and worse still propose the illegal use of herbicides by overdosing resulting in the long term contamination of soils at the property. KleerKut are experienced Japanese Knotweed Specialists who have been successfully managing and eradicating this invasive weed since 2006. We have a proven track record in the construction and commercial industries and are now approved Consultants and Contractors with many of the leading House Builders, Developers and Environmental Consultants. Identification of Japanese Knotweed can be difficult. By simply emailing or texting several photographs KleerKut can give you peace of mind. Successful eradication of Japanese Knotweed requires experience and specialist knowledge. KleerKut offer advice in relation to all invasive weeds including Giant Hogweed, Horsetail and Himalayan Balsam. KleerKut are accredited members of a recognised Trade Association. Contact KleerKut to discuss the contracts we can offer to maintain SUDS Ponds. This service includes grass cutting, general maintenace and eradication of invasive pondweeds. 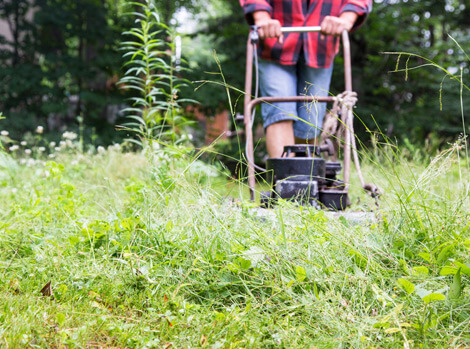 KleerKut can carry out general weed killing on parking areas and driveways. Including the eradication of horsetail which causes damage to footpaths and roads. Our methodologies are based on best practicable environmental options as recommended in the Japanese Knotweed Code of Practice. Our use of herbicides complies with the Code of Practice For Using Plant Protection Products in Scotland. As a professional property manager ensure that your customers have a first class invasive weeds service. KleerKut Ltd would recommend using an experienced company to survey your properties – KleerKut provide a Free Identification Service. KleerKut Ltd can provide standard letters for you to notify your customers to encourage management of any Japanese Knotweed infestation. These letters will also include identification charts and explain their legal requirements and difficulties that may be encountered if selling. KleerKut are accredited members of the Property Care Association. Trustmark is a scheme supported by the Government, consumer groups and the building industry to enable members of the public to find reputable firms to employ. The PCA are one of the founder scheme operators; setting high standards of service and quality for their members which allow them in turn to extend the offer of Trustmark accreditation. KleerKut offer 5 year guarantees as standard, which can be extended if required. Insurance backed guarantees are also available if required by the lender.